Del McCoury has put together an exciting new project, Del & Woody, comprising a dozen original lyrics of legendary folk artist Woody Guthrie that are set to music by bluegrass artist Del McCoury. The project, a brainchild of Nora Guthrie, Woody's daugher, came to completion earlier this year. Del has worked on varied and diverse projects and this would a good fit as the music has similar roots. Nashville, TN -- Del McCoury Band’s Del & Woody, a collection of lyrics left behind by Woody Guthrie and put to music by McCoury, reached #1 on the Billboard Bluegrass chart. As best we can tell (with help from the Woody Guthrie Center), a few songs of Woody’s have charted on radio before, but no project that included only his songs has ever risen to the top of the Billboard album chart. McCoury—who at 77 is no stranger to the top of the charts himself—says he is proud that it was his unique collaboration with the world-acclaimed folk bard of the depression that pulled Woody to the top. Nashville, TN – Del McCoury is at it again. At 77 years young he is still very excited about music and creating projects that will be enjoyed by generations to come. This one might just be the most talked about as it’s rare for two artists to team up on music separated by 70+ years…some of these lyrics were written the year Del was born, but with Woody’s timeless lyrics, and Del’s timeless sound, nothing matters but the songs. Lexington, VA -- Flatpicking guitar phenom Larry Keel dazzles music-lovers once more with his 15th self-released album Experienced, due out February 26, 2016. The album is entirely original work that showcases both Larry’s and bandmate Will Lee’s exceptional songwriting, singing and jaw-dropping instrumental performances, accompanied by Keel’s equally talented wife Jenny Keel on upright bass and harmony vocals. It was recorded at Wally Cleaver Studio in Fredericksburg, VA with engineer (and guest drummer) Jeff Covert and mastered by the award-winning industry great Bill Wolf (Willie Nelson, Tony Rice, Doc Watson) in Arlington, VA.
Del McCoury, a GRAMMY-winning National Heritage Fellow and member International Bluegrass Music Association’s Hall of Fame, was honored with the Bluegrass Heritage Foundation’s Bluegrass Star Award on Saturday, October 17, 2015 at the Bloomin’ Bluegrass Festival and Chili Cook-Off in the Farmers Branch Historical Park in Farmers Branch, Texas. Brooklyn’s newest music venue The Hall at MP will be launching its first series of American Roots music shows with three special performances: The Jeff Austin Band on Friday, November 6, Del & Dawg, the collaboration between bluegrass legends Del McCoury and David Grisman, on Saturday, November 7, and Della Mae on Wednesday, November 11. The Berklee College of Music is set to honor Del McCoury with an American Roots Master award when he performs with his band in Boston on September 12. Berklee College of Music's 2014-15 Signature Series kicks-off with Inspired by Muddy and Monroe with Grammy-winning bluegrass group the Del McCoury Band and acclaimed jazz and blues vocalist Catherine Russell on Friday, September 12. Muddy Waters and Bill Monroe are two American music titans who each helped create and define a blues-based genre: bluegrass, in the case of Bill Monroe, and Chicago blues, in the case of Muddy Waters. Owensboro, KY -- Award winning bluegrass music artists and Hall of Fame inductees Doyle Lawson (2012) and Del McCoury (2011) had their Hall of Fame plaques unveiled at this year's ROMP festival. The International Bluegrass Music Association (IBMA) has a committee that selects the inductees for each year. The two artists saw their Hall of Fame Plaques unveiled between sets at ROMP Fest in Owensboro this past Thursday. 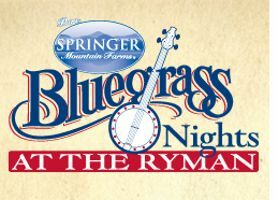 Both the Del McCoury Band and Doyle Lawson & Quicksilver performed during ROMP on Thursday. The plaque unveiling is a major tribute to these Hall of Fame Inductees.